We recently visited Charlottesville Virginia for a weekend, it was an almost half way point to catch up with my brother and sister in law who live in DC. As a gardener I have always wanted to visit the gardens at Thomas Jeffersons Monticello he was an avid collector of plants on his travels and vegetable gardener in fact he grew 330 vegetable varieties in Monticello's 1000-foot-long garden terrace. There were also 170 fruit varieties of apples, peaches, grapes, and more that grew in the orchards. The gardens are now a gene bank for the world preserving historic varieties of fruits and vegetables. Maybe Jefferson knew how important biodiversity is, this is a powerful thought as I read Bread, Wine, Chocolate The Slow Loss of the Foods We Love by Simran Sethi. I highly recommend this book and it will truly make you think of the farmers and producers of our food. The love of it, and how by carefully deciding what to eat and I would say plant in local farms and our gardens we can preserve and save special foods for future generations. Also get away from the culture of mono cash crops such as soy, wheat and corn. We have become obsessed with uniform and perfect looking produce and at a time where food waste is at an all time high. We need to take stock and embrace funny looking produce, heirloom varieties and have fun saving seeds and savoring the flavor of wonderful and diverse foods. Simran is a gem of a person I meet her through twitter and have had the honor of meeting her in person she's a talented journalist and world changer who truly cares please get her book and follow her you won't be disappointed. Take a few minutes and watch Simran's talk on seeds it shows her passion and inspiration for her book. Monticello was a 5000 acres plantation and wouldn't have been as productive without this enslaved workforce. He also had relations with Sally Hemming and 6 children with her, as well as children with his wife. The picture above is a reconstruction of a slave cabin, they were tiny dwellings often in the field where 6-8 people would stay. This one is special as it had a window. The slaves would work long hours in the fields and gardens growing all this amazing produce and not being able to eat it themselves. There is a slavery tour at Monticello its a must to get a full picture of life there. The stories of the enslaved people need to be told. I would love to see them re create the enslaved peoples garden and see what they grew. On the tour I learnt that they sold it to the kitchen so it must have been good. Also that Jefferson documented it showed he respected it. At this point I would like to introduce you to Michael Twitty known as the @koshersoul on twitter I have followed Michael for years on twitter and have had conversations with him. 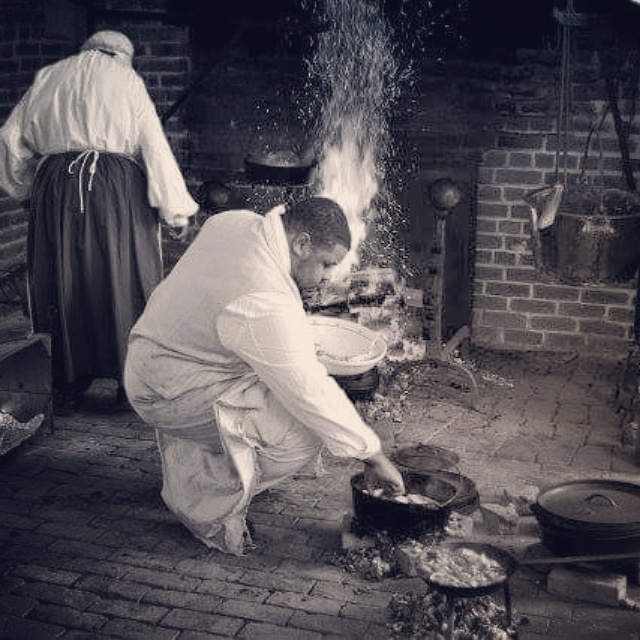 He has been on a personal journey over the last few years tracing his roots and heritage and tells the story of enslaved people often visiting former plantations and historic sites and recreating recipes and cooking as food unites us all. He's amazing and so real and humble I heard him speak last week In Durham at the North Carolina Sustainable Agriculture conference. At the time I went over to thank him and say hi and he gave me a hug made my day. Do follow him and stay tuned he is also working on a book. Here's a talk on Culinary Justice, its so worth a watch/ listen he is such a talented speaker and lovely person. We visited the gardens in the fall, so much of the vegetables are done but there were still a good few fall/ winter crops, such a radishes, kale, herbs and broccoli. It was also great to see sections of the gardens in cover crops such as the clover above. Cover crops also known as green manure add nutrients particularly nitrogen to the soil getting it ready for the next growing season. The kids were fascinated by all the ladybirds flying around another hero in gardens as they eat aphids. I think we will call our farm ladybird Farm. Thats what us Brits call lady bugs. The house from the 1700's and one of the few UNESCO world heritage sites in America. This was a long post for me, but I hope you take the time to discover the wonderful work of both Michael and Simran folks who inspire me daily and work hard to make the world a better place.